We are delighted to announce that we now have an OFFICIAL Apple Distinguished Educator at Portsmouth College. Apple confirmed this morning that they are pleased to welcome teacher and curriculum team leader, Chris Wood, to the Apple Distinguished Educators (ADE) Class of 2019. In 1994, Apple created the ADE Program to recognise K-12 and higher education pioneers who are using Apple technology to transform teaching and learning in powerful ways. Celebrating 25 years, the program has grown into a worldwide community of over 2,800 visionary and innovative leaders in education, helping other educators rethink what’s possible with iPad and Mac. 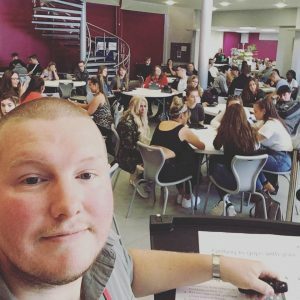 Chris, who began his journey as an ‘Apple Pioneer’ when the College introduced the innovative ‘Creative & Curious Learning Project’ back in 2014, has transformed teaching and learning across the College using apple technology. Chris has progressed in this role and is currently a Lead Apple Trainer within the College, creating partnerships with local educational institutions in the City and sharing his expertise in this sector. This Summer, as part of the Apple Distinguished Educator role, Chris will travel to the Netherlands to attend the ADE Institute for EMEIA (Europe, Middle East, India & Africa) Conference 2019.